Philip Shepherd is the author of “New Self, New World: Recovering Our Senses in the Twenty-First Century.” He leads workshops internationally on the art of embodiment. 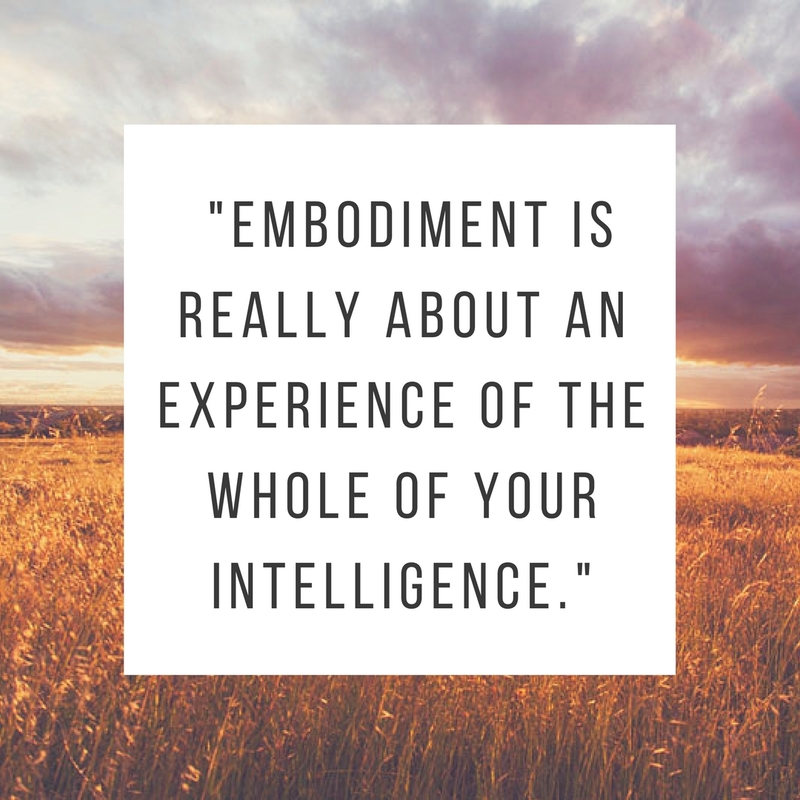 In this interview, Philip talks about embodiment, the body’s three brains, and his workshops centered on reconnecting with one’s being. YogaUOnline: Philip, one of your main tenets is developing embodiment because we have been trained to live in our heads instead of in our bodies. What does the term “embodiment” mean to you? And what led you to dedicate your life to teaching people about the importance of embodiment? Philip Shepherd: To me, embodiment is really about an experience of the whole of your intelligence. We’ve been systematically trained to compartmentalize our intelligence. Thinking happens in the head, and what happens from the neck down is considered inconvenience or interference. So the schism, the primary wound we experience in our culture is a separation between our thinking and our being. We’ve isolated our thinking not just from the body, but from the world as well. We look at the world as though peering at it through a window or the windscreen of a car, which feels so familiar because that’s the way we sit in our heads. Embodiment takes those compartmentalized aspects--our head, our heart--and experience of the whole of our intelligences together. YogaUOnline: How does that separation relate not just to how we relate to our bodies but how we relate to life? Philip Shepherd: Once you realize how stuck we are in the head, you begin to appreciate how everything we do tends to be in a top-down modality. For example, our breath: we sit up in the head and push the breath into the body because we know a deep breath is important but it becomes a top-down experience rather than a release of the body’s tissues and cells to the breath as a whole. The tacit risk in any modality of bodywork is that you’ve got a picture in your head of what the body should do and you make it do that, but you miss the feeling, you miss the attunement and intelligence that a sensitized body is coursing with. YogaUOnline: Fill in some of the blanks for us: How did you come to this work? What inspired you to write a book, teach workshops internationally, and what were some of the personal experiences that developed your teaching? Philip Shepherd: As an early teenager, I lived with the sense that my thinking was being funneled down well-worn grooves established by the society surrounding me. I knew that the patterning and the hierarchies and thought-forms and language of my culture all conspired to tell me a story about what it meant to be human. And that story said that to be human is to live in your head, to be divided from the world, to be divided from yourself: idea trumps experience. I fought this and I fought it, but I knew that I would eventually succumb if I didn’t leave my culture. So at eighteen, I went to England and bought a bicycle and headed off for Japan, thinking as an eighteen year old might, that if the bike is headed in the right direction and I don’t stop pedaling, I’ll get there. That bike trip took me through so many ways of understanding what it means to be human, and I found every one of them illuminating and liberating. At the same time, I recognized that each is limited. Every story about what it means to be human is a limitation. I think that’s why initiation rites were so important because you go on a walkabout, you go on a vision quest and you encounter reality directly. There is no mediation--you are alone in this experience and you realize that no story can contain reality. It’s just not possible. So then, you come back from the initiation rite with the recognition of the value of the story and at the same time a recognition of its limitations. And you will never again see the world in the same way. YogaUOnline: You have expressed a resonance with the Japanese ancient Hara tradition, which shares with the Chinese Lower Dantian, the concept of an energetic center of our being essentially located in the lower part of our body. Modern neurologists now are talking also about that area the belly, the pelvic bowl as a second brain. How do those two parallel streams of thinking relate to each other? Philip Shepherd: Science sort of recognizes three brains in the body. The cranial brain, the brain in the pelvic bowl (which is called the enteric nervous system), and the heart. The heart has such a density of neural tissue that many recognize it as the brain. I think there’s more than just a coincidence to the fact that cultures speak of thinking with the head, cultures speak of thinking with the heart, cultures speak of thinking with the belly. The enteric nervous system was actually finely embraced by neuroscience in the 1980’s and we resisted it for years. We resisted it through neglect. We resisted it in so many ways for the better part of the century at that place because there’s no place in our culture story about what it means to be human for a brain in the belly. That brain which connects through the vagus nerve affects everything; it creates ninety-five percent of the body’s serotonin. And there’s the gut bile, all the interactions that happen there and the brain in the belly in evolutionary terms is our first brain. The cranial brain was a later development. Somebody can be in a vegetative state where the cranial brain is inactive and they can still live if that first brain is functioning. If the first brain stops functioning, this won’t keep us alive. As a culture, we’ve put all our faith in and all our accolades on the brain in the head. We think reason is supreme, and we try to think our way through problems and stop feeling them. When that schism between our thinking and our being actually heals, you feel every thought. There is no division between thinking and feeling. But we give reason this place of supremacy in our culture. In the most important things in our life, reason is utterly impotent. You can’t reason your way into the present. You can’t reason your way into luck. You can’t reason your way into your soul’s purpose. So, to come back to your soul’s calling, to come back to your life in this moment is to come back to the body, to come back to that deep, deep knowing in the pelvic bowl that comes into felt relationship with the world around you. YogaUOnline: How do you help people to reconnect with this dimension of our being? Philip Shepherd: In the workshops I teach, I move through four themes on the course of the weekend. The first is breath. We have been patterned to muscling the breath. We don’t know what it is to release the body to the breath. When you try to initiate the breath through muscling, you’re working against the body’s intelligence. The principle that informs my breathing is that every part of the body should be available to the breath. We work through several practices that soften the body into the breath and especially the pelvic bowl. There are also practices that look at how we interfere with the breath. The second theme is rest. The work on breath sort of awakens the sensitivity of the pelvic bowl. Then, you can come to rest in the body because in our culture, we’re trying to get back into the body but we don’t know where to land. There is no firm distinction that can be made between the body’s energy and the mind; if my mind is unsettled, my body’s energy is unsettled. If my body energy is calm, my mind is calm. These are manifestations of the same thing. Then, you can bring your sense of awareness deep down into the pelvic bowl so that it comes to rest on the perineum. When the center of your awareness is at rest on the perineum, you enter a completely different realm of your consciousness. The third theme the workshop moves to is receptivity. Once you’re there at rest on the pelvic bowl, on the pelvic floor, on the perineum, you can move into a place of receptivity. Receptivity, in one sense, is the same as presence. If I can’t receive your presence, I’m not present to you. If I don’t receive the sensations to my breath, I’m not present to you. So then, to receive the world into that place, to actually feel the world living within you, then it enables you to integrate, which is the fourth theme. So, what we’ve lost in our culture by living in the head is the ability to integrate. The head is great at analysis but the word “analysis” means “to break apart”. We’re trying to create a whole picture of the world through analysis. It’s a contradiction in terms almost. 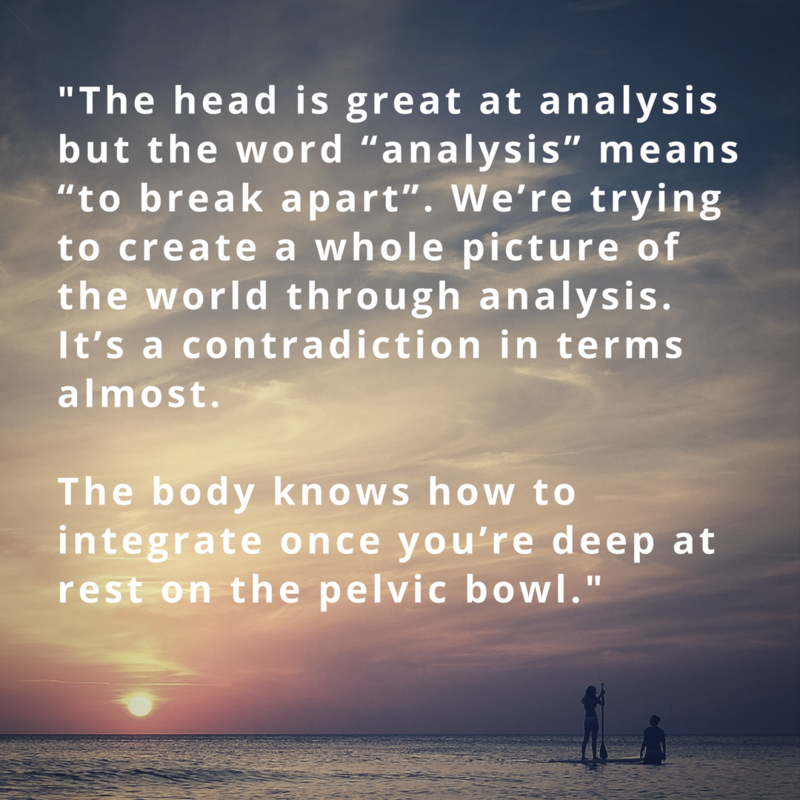 The body knows how to integrate once you’re deep at rest on the pelvic bowl. On the pelvic floor, you’re in a place of repose within the body’s genius for integration. You feel the whole, and your thinking and your being have reunited. With this, you move into a sense of wholeness that our culture is blind to, because our culture is too intent on independence and that fantasy of independence that it conceives of wholeness as something that happens within a bound. To think that my wholeness is something in the boundary of my skin is shortsighted. To speak of being a whole in body, mind, and spirit, as if wholeness were just a matter of bringing these three aspects of myself into balance and allowing each of them to flourish is incomplete. It’s ridiculous to think I can be whole out of relationship with the world. We speak of senses. This is the very fantasy that the five senses we acknowledge uphold, because each of those senses implies a boundary. Sight – light crosses the eye and lands on the retina. A stimulus from the outside crosses the boundary of the self. The same with hearing, the same with touch, taste… It’s all about external stimuli crossing this boundary of the self and being registered. Well, what about balance? We speak about a sense of balance- there’s an organ devoted to balance but it doesn’t qualify in our culture as a sense because there is no boundary. Balance is a felt relationship. The center of the earth is felt in relationship to your center of gravity and they come to a relationship. There is no stimulus from the outside crossing a boundary of the self. It’s a mutual exchange. I think of the body as a bell and the body, it resonates. It’s a resonator that rings to the world around it and the currents of the present are innumerable. The world is not a world of four dimensions. It’s a world of five dimensions. 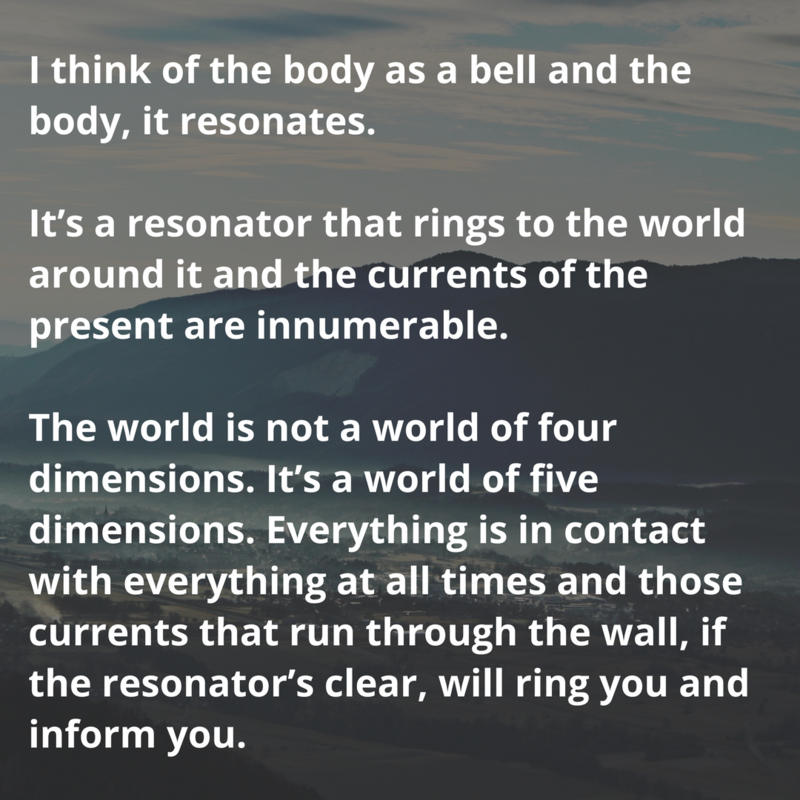 Everything is in contact with everything at all times and those currents that run through the wall, if the resonator’s clear, will ring you and inform you. But in our culture we stuff cotton balls into the bell and it loses its resonance. When the bell loses its resonance, the present no longer exists. You can’t feel it. You don’t get information from it, and then, why would you leave your head? Because this is where you know and knowing is understood as objective knowledge rather than that deeply informing knowledge of the body that feels wordlessly and knows intuitively or pre-consciously.